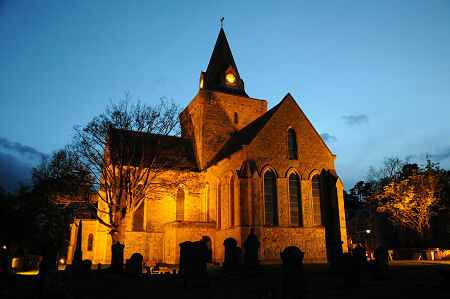 Occupying a prime location in the centre of Dornoch, Dornoch Cathedral has been in use since 1239; but it was a slightly more recent event that really placed it on the world map for the first time. In the spotlight of attention from the world's press, and under the video camera of an intruder hiding amid the organ pipes, a very worldly Madonna had her son christened here in December 2000. 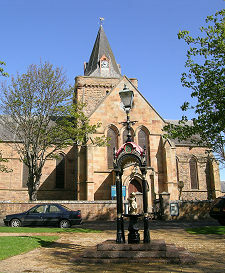 From the outside, Dornoch Cathedral has a solid, bulky, almost squat feel to it, in no small measure due to its cruxiform shape and broad tower. Inside, this shape lends an air of spaciousness and grandeur to what is not, in absolute terms, really a very large building. The overall feel is one of intimacy; of underlying character. And while you never notice, it only adds to this sense of character to know that none of the four arches at the central crossing are of quite the same height, and that the four main piers are not uniformly spaced. 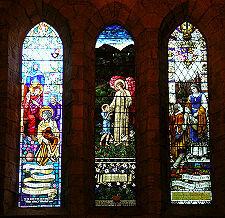 What you will notice, wherever you look, are the magnificent stained-glass windows. There are twenty seven of them in all, and the overall effect is a magical one of ever changing light as the sun streams into the Cathedral from different directions as the day progresses. You will also, without any doubt, notice the organ as you make your way around the Cathedral; and you will gradually become aware of the stunning woodwork. The wonderfully carved pulpit, together with the matching oak pews and communion table, were installed in 1911, and add much to the atmosphere and majesty of the Cathedral. But this has not always been such a tranquil place. 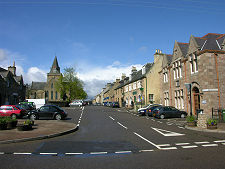 Dornoch was selected as the location of the Cathedral Church of the Diocese of Caithness in 1222 by the then Bishop, Gilbert de Moravia. 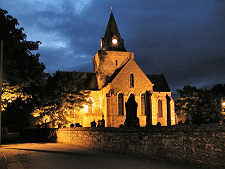 He may have chosen the location because of Dornoch's religious connections dating back a further five hundred years or more. Or he may have chosen it to avoid the fate of his immediate predecessor, killed by farmers in at his residence in Halkirk. Whatever his reasons, the building was sufficiently complete to hold its first service in 1239. After his (natural) death in Scrabster Castle on 1 April 1245, Gilbert de Moravia was canonised as a saint. The history of Dornoch Cathedral continued in a reasonably orderly way until 1570, when a clan feud between the Murrays of Dornoch and the MacKays of Strathnaver led to the latter setting it on fire. This completely destroyed the nave, and the roof of the remainder of the building. Partial re-roofing followed in 1616. Meanwhile, wider changes were afoot, and the church was for a short period Episcopalian following the Reformation, before subsequently becoming the Presbyterian Church for the area. 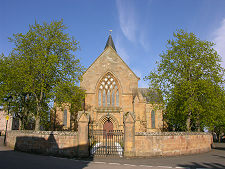 It is thus no longer, literally, a cathedral, a term alien to the Presbyterian Church: but the name is retained to reflect Dornoch Cathedral's earlier history. The damage from the 1570 fire was not finally repaired until 1835-7, during which time a new nave was built over the ruins of the original structure. However, the interior as it appears today dates back only to 1924, when the lath and plaster the Victorians used to cover the interior was finally removed, leaving the revealed stonework to complement the woodwork and the organ.